At their December meeting, the NDDC Board outlined the organization’s Work Plans for 2009. 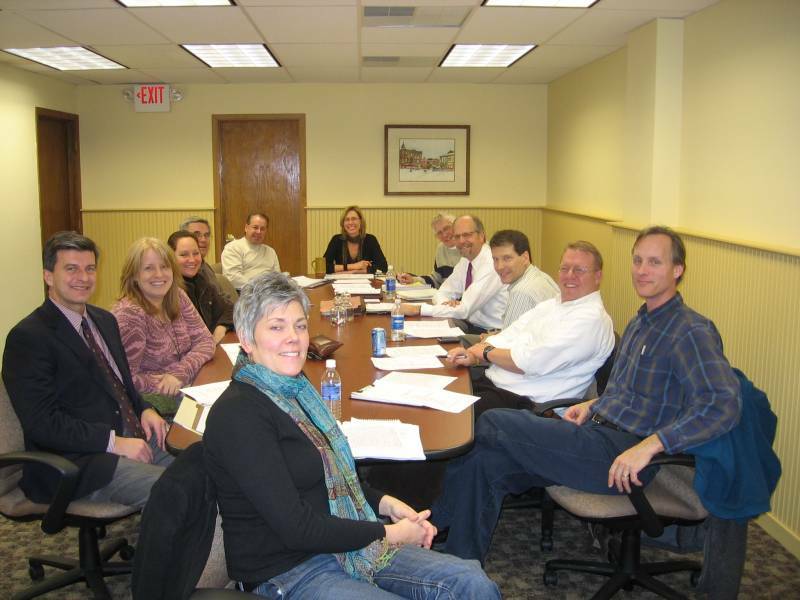 Moving clockwise and starting from the left are: Mark Quinnell, Leanne Stremcha, Anastasia Balfany, Dave Shumway, Joe Grundhoefer, Mary Rossing, Keith Covey, Dan Bergeson, Rob Schanilec, Greg Kneser, Robert Bierman, and Jessica Paxton. • Re-establish a finance committee. • Each board member should take on at least one project. • Need administrative help for executive director in critical areas. • Hold six forums and four Block Head meetings in ’09. • Conduct Twelve Board Visits to Businesses in ’09. • Finish update of integrated database of partners, stakeholders, and downtown businesses. • Ship Beta-Stage Retail Index Reference Project in ’09. • Continue our sponsored promotions, cooperate with other organizations’ promotions and support collaborative efforts of retailers. • Make progress on a “Virtual Division Street” program. • Determine use for the new-resident data we get from Welcome Services for You. • Hold Annual Meeting in ’09. • Transition from current parking task force into standing committee. • Advocate for continuing the Streetscape improvement program and a more active downtown maintenance program. • Revive effort for Newspaper Corrals: Revive this effort. Note: We will need an ordinance requiring all distribution boxes to be located only in corrals. • Continue advocating for public toilets downtown. • Promote, support, collaborate in, and contribute to erecting a permanent, changeable copy sign at 5th and Hwy 3 in Ames Park. • Revisit outside dining ordinance; it sunsets in ’09 and will have to be readopted. • Continue working on property tax reductions. • Continue working (collaboratively) on In-Fill and Redevelopment Initiative. • Turbo-Charge efforts on Retention, Recruitment, Restructuring. • Continue working toward NDDC participation in a high priority development project.